There are hundreds of workout trends and ways to work out. Ranging from yoga to powerlifting, everyone likes to work out in their own way. Before college, I was a competitive swimmer, training all year round, including doing CrossFit. Too many times to count, I have mentioned my love of CrossFit to people, only to be lectured about how bad it is for my body. In this blog post, I want to look into whether CrossFit is “good” or “bad”, who it is best for, and what kinds are the best. 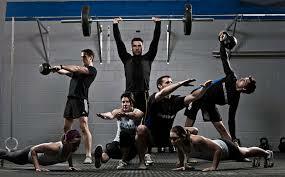 CrossFit is a strength and conditioning system promoting physical fitness. This system combines a variation of exercises through combining weight lifting, sprinting/distance running, and gymnastics. CrossFit challenges their members to be proficient in 10 movements: “cardiovascular/respiratory endurance, stamina, strength, flexibility, power, speed, agility, balance, coordination, and accuracy”. Typical CrossFit gyms create a “Workout Of the Day” (WOD) for their members, which is known to target specific body muscle groups or promote an area of fitness in the body. The emphasis of a WOD is on speed and total weight lifted, not technique. CrossFit is designed to build muscle mass through their intense yet quick workouts. Critics of CrossFit state that CrossFit athletes are more prone to injuries. They also claim there is a lack of guidance for beginners. Without knowing proper technique, beginners can dive right into a WOD not knowing the proper movements, causing injury. People claim it is because CrossFit focuses on speed and weight rather than form and effectiveness. Regular athletes can also be in the way of danger, because anyone who exercises strenuously at a very fast pace without proper warm-up or form can be prone to injury and health issues. Right now, there is no definitive research to support or refute these critics (which I believe is because CrossFit is a very new way of working out). One of the biggest health issues from CrossFit is Rhabdomyolysis (also known as Rhabdo). This is a serious and potentially deadly illness that results from the catastrophic breakdown of muscle cells. It can end as kidney failure, and ultimately death. This is very common in CrossFit because CrossFit athletes are constantly encouraged to push themselves above their physical limits, causing their muscle cells to explode and die. In addition to Rhabdo, there are studies to test “body part specific” injuries. 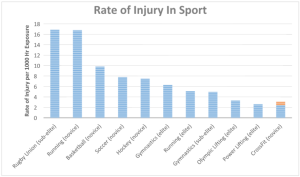 To see how common injury rates really were, I found a study observed injury rates and patterns among current CrossFit athletes. The study consisted of 486 CrossFit participants, with 386 meeting inclusion criteria. 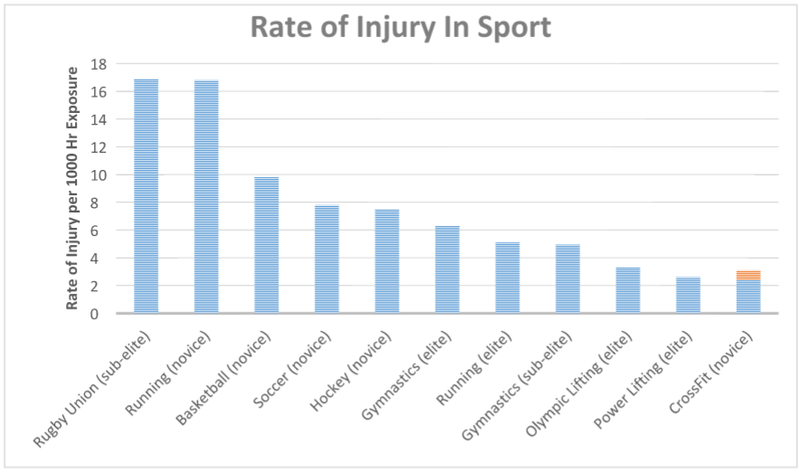 The overall injury rate was found to be 19.4%, with males more likely to be injured than females (p=.03, meaning there is only a 3% probability this happened by chance). I believe that males were more likely to be injured than females because I feel that men are more influenced by peer pressure. When being told to do more reps or add more weight, I believe that females would be more rational with knowing what is good or bad for their body, while men want to impress each other. This study also concluded that of the 84 people reporting injuries there were 21 shoulder injuries, 12 lower back injuries, and 11 knee injuries. Lastly, the study found the injury rate to decrease with trainer involvement (p=.028). This clearly shows that trainer intervention can help athletes work out effectively, while safely doing movements and adding weight. While this study observed several different key factors, could it have all been by chance? Yes. This study doesn’t provide a conclusion about whether or not CrossFit is bad. These numbers could be a result of chance or a result of false positives, concluding that something is going on, when it really isn’t. What the study does show is bodily injury can be reduced with the assistance of a trainer, and with males more likely to be injured than females. I think these are important statistics because simple precautionary measures can be taken (like having a trainer assist you) to ensure safety. To follow up, I looked at another study. The second study I found also looked at proportions of injuries through CrossFit. This study surveyed 132 people, and had 97 responses claiming to have sustained an injury during CrossFit training (that’s 73.5%!). This study was done in the UK, while the first study was done in New York. This could be significant because New York (or even just American) gyms could be “safer” places to do CrossFit. A trainer who doesn’t focus of teaching and correcting, but on adding speed, weight, and reps is probably a trainer found at the gym in study two. Clearly, this data does not line up. So which one is “right”? Technically, they both are (because we are going to assume the studies were done right). These widely skewed answers could be a result from a number of things: trainer skill level, workouts done, health of athlete…the list goes on and on. These studies may just also not be very reliable (but were what was available on this issue). They were not very reliable, because these injuries were self-reported. Being self-reported, people may over-report their injury (say they have an injury when they really don’t) or under-report their injury (say they don’t have an injury but do). While my third study was also self-reported, it measured CrossFit injuries compared to other sporting injuries. This study concludes that rate or injury per 1,000 hours is actually much lower for CrossFit than with a multitude of other sports (see graph). In two studies (within this one), CrossFit’s rates were calculated at 2.4 and 3.1 per 1,000 hours of exposure. While these are only two studies, all will vary. There are so many factors that can cause injury, and some of these injuries could not be just from CrossFit training. We would have to look at multiple different studies. All three of my studies claim that there is little to no research in the field, but I still found it something worth analyzing and blogging about (even if it made it a lot harder and not super concrete). While many more studies need to be done to see if injuries are actually caused more in CrossFit than other workouts, clearly all three studies show that there can be dramatically different results when studying the same thing. CrossFit has also been applauded for its results through powerful and intense conditioning. This specific form of exercise has been found to provide the most results without requiring significant time in a gym with the typical WOD style workout. Another positive aspect of the CrossFit “fad” is the sense of community it has created. Their official website (CrossFit.com) offers workouts, gym affiliates locations, free resources, frequently asked questions, and a community discussion for exercises and nutrition. The aim to qualify for the CrossFit games also creates a sense of community and motivation for top athletes. While there is not research on this data, scientists could potentially do a psychological experiment to support this theory. To summarize: Some people love CrossFit because it offers a very quick, muscle-building workout in a very short amount of time. Others hate it because it doesn’t focus of form and fear the rumors they have heard about causing injury. Even through my studies, it is hard to really know if CrossFit really does cause injuries more than another workout would. I wish there was more concrete evidence, but hopefully as the trend of CrossFit grows, more research will be done to have a more definitive answer on whether or not CrossFit is “good” or “bad”. In conclusion, the call is up to you. Yes, from the studies analyzed, there is a risk of doing CrossFit (but maybe not as much as other sports). But do the benefits for you outweigh the costs? 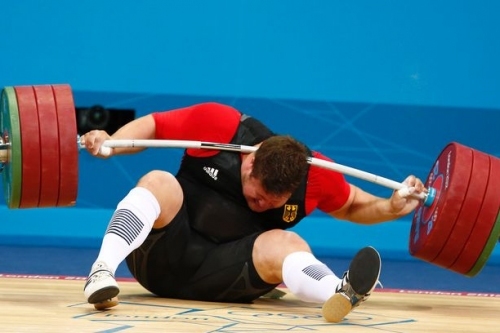 Clearly your chance of injury factors more than just doing CrossFit but the intensity you do it at, the weight you use, if you have proper form (and a trainer helping which will decrease chance of injury). Previous health can also play into CrossFit. In my opinion, CrossFit can have benefits to its athletes, but only if done properly with a trainer assisting and monitoring the athlete. This entry was posted in Uncategorized on October 12, 2015 by Samantha Elizabeth Schmitt. I know very little about CrossFit first. Therefore, I really enjoyed reading your blog because it was very informational about the health benefits(or lack thereof) of doing CrossFit. The training for CrossFit is insane and I give major credit to anyone that would put their body through the physical tool CrossFit has on your body. I view CrossFit similar to running a marathon in the sense of its health impact. Even though running is healthy for the human body, running marathons should only be done once in someone’s lifetime. If you would like to read more about marathons possible impacts on the human body. Here is the article I found about marathons from Men’s Health and hope you enjoy!